The makers of 1313 Magazine "The Phantom Monster Show" are back from the grave with an all new horror reading experience Monster Shindig! 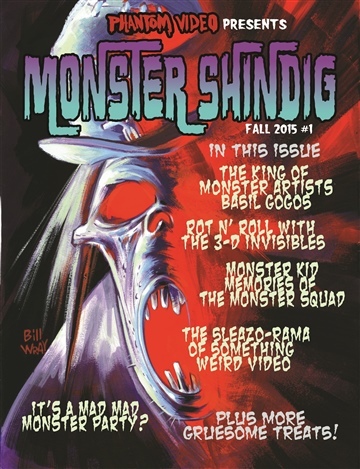 This spine-tingling magazine features The King of Monster Artists Basil Gogos, Something Weird Video's Lisa Petrucci, The 3-D Invisibles, Mad Monster Party article by Rankin/Bass historian Rick Goldschmidt, Monster Squad article by Shawn Robare of Branded in the 80s, plus more blood-curdling fun, due out just in time for Thanksgiving, and the Holiday shopping season! We're currently offering a special PRE-ORDER sale on this 64 page full color issue! The first 40 customers will receive a Phantom Video GRUESOME GOODIE PACK that'll include original IT CAME FROM THE 80's movie trading cards, and monster buttons. This PRE-ORDER will be going toward's production including; printing, and packaging. Like a twisted Mom n' Pop Video Store, I've been creating radical stuff since 1980!